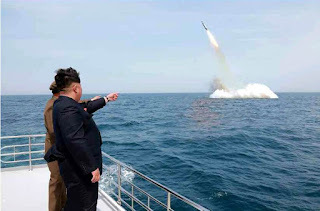 North Korea fire missile from a submarine but it failed after the launch said the South Korean military. The missile was launched at about 11.30 am Seoul time in waters east of the Korean peninsula. Neighboring Japan, the United States, and South Korea's military condemned the missile launch as a flagrant violation of U.N. sanctions. News said that the missile engine ignited successfully but the projectile soon exploded in mid-air at a height of 10 km. The missile was detected in the sea southeast of the North Korean city of Sinpo, South Korea's military said. Satellite images show that Pyongyang is trying to develop its submarine launches missile programme in this area. At it has started a fast process of developing such a missile and a huge amount of money is being spent on the development. The U.S. Strategic Command, whose mission is to detect and prevent strategic attacks against the United States and its allies, said it had detected what it believed was a KN-11 submarine-launched ballistic missile. The North regularly threatens to destroy the Japan, South Korea and the South's main ally, the United States. This missile launch is a clear challenge to the south to the UN security council resolutions. The North have also tried to launch a long-range rocket in the following month. North Korea rejects the sanctions as an infringement of its sovereignty and its right to space exploration. North Korea have also launched a missile towards the japan which covered a distance of 400km. South Korea and the United States said on Friday they would deploy the Terminal High Altitude Area Defense (THAAD) anti-missile system with the U.S. military in South Korea to counter the threat from nuclear-armed North Korea.